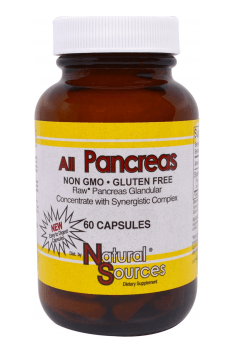 Natural Sources All Pancreas is a natural dietary supplement containing a synergic composition consisting of specially selected bovine pancreatic tissues subjected to lyophilisation, an American ginseng extract, and maltodextrin obtained from tapioca. The preparation has a beneficial effect on carbohydrate metabolism, supports digestive processes, and is free of pesticides, growth hormones, antibiotics and chemical additives. The tissues contained in the product were lyophilised, which means they were dehydrated through the sublimation of the frozen product in temperature below 5°C, thanks to which they retained all the essential vitamins, enzymes, nucleotides, lipoproteins, and other crucial cellular components. The unique form of the capsules makes it easier to absorb from the gastrointestinal tract and helps to achieve the highest efficacy. Pancreas is a complex organ also called “the dual gland”. Inside the exocrine gland, there is also the endocrine gland scattered. The basic mass of the pancreas is the exocrine part. It is responsible for producing digestive enzymes, which are then released through the pancreatic duct to the duodenum. The endocrine part of the pancreas constitutes a much smaller proportion of the overall mass of the organ (about 3 per cent), and consists mainly of cell groups that have a specific structure and perform a specific functions – islets of Langerhans. The endocrine part is responsible for the synthesis and secretion of: glucagon, insulin, somatostatin, and pancreatic polypeptide. The main role of the hormones is maintaining normal blood glucose levels. β cells release insulin – an anabolic hormone that reduces blood glucose concentration, while α cells are responsible for the secretion of glucagon, whose activity is opposite to that of insulin. As pancreas has two crucial functions in the organism, the preparation exhibits an extended range of effects. The exocrine function of the pancreas, responsible for the production of digestive juices containing digestive enzymes (like pancreatic lipase, pancreatic amylase, trypsin, chymotrypsin, phospholipase, esterases), supports digestive processes by facilitating protein, fat, and carbohydrate breakdown, while its endocrine function plays an important role in carbohydrate metabolism through, among other things, the production and secretion of insulin, responsible for the transport of glucose inside cells, which helps to reduce glucose levels in the blood. To sum up, Natural Sources All Pancreas is a dietary supplement that promotes the health of the pancreas in natural ways. The preparation can prove beneficial both in the case of exocrine pancreas insufficiency by supplementing enzymes and supporting digestive processes, and in the case of endocrine insufficiency by helping to maintain normal blood glucose levels. As a dietary supplement, take one to four capsules daily, following a meal. Preferably, take the preparation with a meal and a large amount of water. It should not be taken with milk or milky foods, as well as fruit and vegetable juices. The right dosage of the preparation should be adjusted individually. At first, it is good to start with 1 capsule taken after the most copious meal. NATURAL SOURCES – a manufacturer of food supplements containing carefully selected ingredients of natural origin, only form reliable sources. The company supplies its products to the people who care about healthy eating, and seek only the best quality preparations supplementing their diet. Capsule (gelatin), maltodextrin (from tapioca), magnesium stearate (vegetable source) and silicon dioxide.